There is some confusion regarding the date of the National Date Nut Bread Day. Some people celebrate it on December 22 while others are convinced that it is observed on September 8. The second date is slightly more popular as it is within holiday season, and date nut bread is a popular holiday treat. 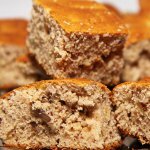 Date nut bread is very quick and easy to cook. Put 1 cup pitted chopped dates, 1 cup coarsely chopped walnuts, 3 tbs vegetable shortening, 1 1/2 tsp baking soda and 1/2 tsp salt in a bowl. Pour 3/4 cup boiling water over and stir wall. Let the mixture rest for 15 minutes. Using a fork, beat 2 eggs and 3/4 cups sugar together in a bowl. Add 1 cup all-purpose flour and 1/2 whole wheat flour and stir. The batter will be very stiff, it is normal. Add the date mixture and mix briskly until you get well blended batter.